Cabbage is a leafy vegetable that grows in heads, family to kale, collards, broccoli and brussels sprouts. Cabbage varieties range in color from light to dark green to red to purple. The head can range in shape from round to flattened or pointed with layers of superimposed leaves. Green varieties are the most popular type grown and are used to make cole slaw and other types of raw and cooked salads. The red varieties are used to add color to raw salads and cooked dishes. Cabbage is a good source of dietary fiber, vitamin C and essential phytonutrients. Cleaning: Remove outer leaves and discard. Cut cabbage in half with sharp chef's knife. Then cut each half into thin strips. Submerge in large pot of cold water and rinse thoroughly. Discard water and repeat. Transfer cabbage to colander and shake dry. Use cabbage as desired. Sometimes young cabbages are picked early when it is tender and small, and it is eaten as "baby veggies". Those vegetables are more tender and sweet then older picked cabbages, and can store for a longer time. 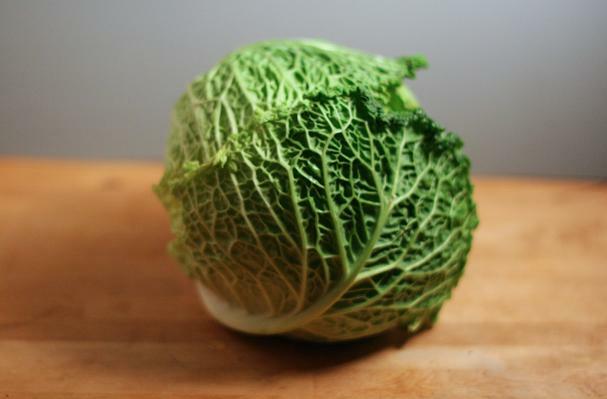 Cabbage is the basis for the German sauerkraut, Chinese suan cai and Korean kimchi. To pickle cabbage it is covered with a brine made of its own juice with salt, and left in a warm place for several weeks to ferment. Sauerkraut (colloquially referred to as "kraut") was historically prepared at home in large batches, as a way of storing food for the winter. History: The cultivated cabbage is derived from a leafy plant called the wild mustard plant, native to the Mediterranean region, where it is common along the seacoast. Also called sea cabbage and wild cabbage, it was known to the ancient Greeks and Romans; Cato the Elder praised this vegetable for its medicinal properties, declaring that "It is the cabbage that surpasses all other vegetables."